Hahahhahahhahhahhah. Now, this is so funny. Has religion actually turned people into fools? 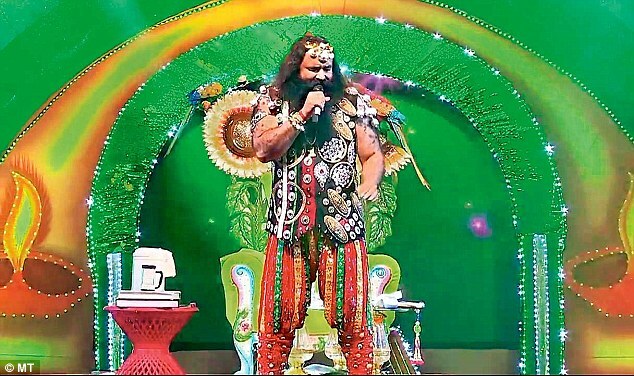 An indian guru named Gurmeet Ram Rahim - known as the 'guru in bling' for his penchant for garish clothes and jewellery ordered 400 of his followers to undergo castrations he said would bring them closer to God and will enable them see God at his ashram (temple). Not only did he order castrations of his male members , he also sexually exploited female followers. His ardent follower Hansraj Chauhan, lodged a complaint in court alleging he was manipulated into being castrated at the ashram after doctors acted on the Guru's orders. He also said guru Rahim had been ordering castration's of followers since year 2000. The Indian Central Bureau of Investigation (CBI) are currently carrying out investigations. As expected , Guru Rahim, 47, responding to the accusations, told a press conference he is considering legal action of his own against his accusers. 'Such allegations disturb me, when I am doing good for humanity. Therefore me and my legal advisor are going to move the court challenging the allegations,' he said.